"Dr. Perlmutter's book is among those rare and exciting exceptions: information so empowering, so enlightening, and presented so clearly and concisely that the reader emerges far better off for the reading experience. Put this book on your short list of must-reads for health and nutrition." "William Davis, MD, author of Wheat Belly""
"The research in Brain Maker was a revelation to me. And it will be to you as well. And, most importantly, you don't have to wait for this information to become mainstream. You can ensure your brain health-and that of your family-by following the practical program outlined here." "Christiane Northrup, MD, author of Women's Bodies, Women's Wisdom and Goddesses Never Age ""
"The single most important medical innovation in the 21st century is making the link between the gut and the little bugs that live there and nearly every chronic disease - from autism to depression, from asthma to autoimmune disease, from diabetes to dementia. Brain Maker is a game changer. For the first time, this brilliant scientist doctor connects the dots and teaches us why we need to tend our inner garden (our microbiome) and provides a radical but simple plan to reset, reboot, and renew your microbiome. 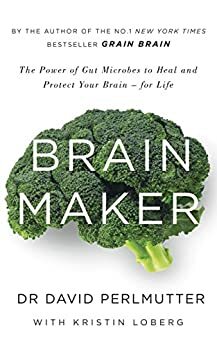 This book shouldn't be called Brain Maker, it should be called Health Maker." "Mark Hyman, MD, author of The Blood Sugar Solution""
"Thanks in large part to dramatic and ongoing increases in understanding the brain-gut-microbiome connection, there is new hope for the treatment of many neurological conditions, from autism to Alzheimer's to multiple sclerosis. David Perlmutter is a leader in this burgeoning field, and his new book, Brain Maker, is a landmark contribution." "Dale E. Bredesen, MD, professor and director of Alzheimer's Disease Research, UCLA""
"Humans outsource digestion to our gut bacteria. Dr Perlmutter takes us on a journey to understand how these foreigners profoundly influence our brains-for good and bad." "Mehmet Oz, MD""
"In this revolutionary new book, the nation's leading integrative neurologist, David Perlmutter, gives you a powerful program to heal your gut and optimize your brain. I will recommend it to all of my patients and friends." "Daniel G. Amen, MD, founder of Amen Clinics and author of Change Your Brain, Change Your Life and Healing ADD""
"Bravo! Dr. Permutter's latest paradigm-shifting book shows us how to manage our health, and especially our brains, through the new frontier of science, the microbiome. By connecting the dots from our gut to our brain, he explains how we can avoid disease, age well, handle stress, and manage our moods. With revolutionary ideas and practical advice, he gives us a fighting chance against brain decline. I love this book!" "John Ratey, MD, author of Spark and coauthor of Go Wild, Clinical Professor of Psychiatry, Harvard Medical School""
"Dr. Perlmutter engagingly explains the hope-generating power of the new gut microbiome-brain science, motivating you to regenerate your brain health with his powerful and practical program." "Martha Herbert, MD, PhD, Assistant Professor of Neurology, Harvard Medical School""
I have yet to apply in total the advice for better health and wellbeing. I have changed what I eat more to what David suggests, (less or no wheat flour ingredient, eat natural yogurt and a teaspoon of coconut oil, D3 capsules) and I have already experienced a difference in alertness and cognitive functioning. At 70, I probably needed to change and it has made a difference so far in just 3-weeks. A very well-written and helpful book with many recipes for fermented foods to help improve the Gut. Dr Perlmutter is a Master at being able to explain complex science in a way all should be able to understand. I recommend this book to anyone and everyone, as I believe all could benefit from the information it contains. Informative, wholistic and highlighting the interconnected niess of all body systems to wellness. A informative reminder that body functions as an integrated ecological system. Revolutionary ideas and I love the way he questions the status quo and crappy advice given by most nutritionists. Easy read, clear science, plenty of food for thought. You can dip in and out around medical conditions conditions that might interest you. If you want to explore the food side of thing there are simple recipes included. I could not put this book down. Everything made sense. An amazing continuum of lightbulb life changing moments for me. A truly fascinating book that really blows the lid off conventional thinking about so many of our 'modern ailments'. A very worthwhile read for anyone suffering from brain related problems and even those who think they are healthy. It is a bit repetitive and sometimes it goes from using plain english to very complex medical terms without proper clarification.